Home / Weirdest thing that’s ever happened to me, by far: Fly To The Rainbow? 1. Apparently, an interview I did on generating leads through building sales systems has either just been posted or maybe even reposted. The other evening, I was sitting at my desk going through an old pile of papers I stumbled across from when I was a kid. The papers are filled mostly with quotes and song lyrics I was listening to back then. Stuff I wrote down that had meaning to me at that particular time. I look down at this one lyric and a get a warm fuzzy feeling coming up the back of my neck and over the top of my head – kind of like “electricity.” But I’m not really sure why I feel this buzz coming over me. 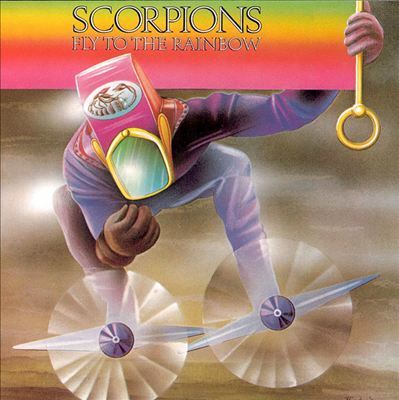 The lyric was from a song on a 1974 album by the Scorpions, called Fly To The Rainbow. I look up at the screen of my iMac, and… I suddenly realize why I have the chills. At that exact same moment, I was listening to the exact same album. What are the odds of something like this happening?